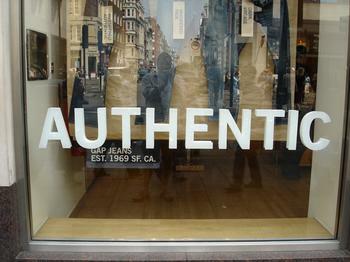 Authenticity. It is something that appeals to me in other people and something that I would like to think that I possess. So is humility. But, authenticity and humility, I don’t think, are really character traits that I have as much as they are destinations that I hope I can arrive at sometime down the road. I can’t remember who it was (perhaps Brennan Manning or C.S. Lewis) who basically said that humility doesn’t necessarily mean being meek, mild, and passive, but, it is knowing who you are and living out of that knowledge. By this definition, I cannot be humble because of the the fact that I can’t seem to keep a steady eye on just who it is that I really am. Just as a photograph never captures the true essence of what a person actually looks like, I can’t seem to hold an objective perspective on my own identity for more than a fleeting moment. When the real and unspun me does make an appearance he comes unannounced and leaves before I’ve been able to brew a pot of coffee to share during the conversation that I’d like to have with him. My wife and anyone else who routinely spends time with me will tell you that I am fairly scatter-brained. I always misplace things. I often forget to do things that I was asked to do. And then when I do things that I was asked to do, I tend to forget exactly how I was supposed to do it and end up not doing it correctly. This pattern seems to affect my sense of who I am, too. My self-diagnosed neurotic tendencies, my fascination with aesthetic aspects of life, my persistent desire for easy-access instant gratification, my introspective tilt, competitiveness, concern for what others think, and the slew of insecurities that I have all combine to form a bubbling brew of sludge that easily sways, tips, and sometimes spills. Tact and propriety don’t seem to come naturally for me while truly loving others and placing their needs and desires on an even keel with my own seems, most often, to be nothing more than a pipe dream that never materializes. And thats just what is often most frustrating to me. The fact that I can often spill my innermost thoughts through a blog or a poem without hesitancy would be quite convenient if there was something truly worth sharing with someone else, but, the lack of consistency in my personal and spiritual walk makes my words nothing more than a floating, unlit buoy off the coast in the thick of a foggy morning. The truth is that I recognize the negative effects of so many of my tendencies, idolatries, and activities. My lack of discipline when it comes to prayer and focusing on that which is sound and true, as opposed to that which is shallow and fleeting, consistently keeps me at least at arms-length away from coming into contact with the real me that God intended whenever it was that He first thought of my life and His purpose for it. I recognize the trend of my own futility, but, I never end up moving on that recognition in order to adjust my course and learn from my mistakes. I’m inclined toward truth and authenticity, but, too lazy and distracted to grab it. It is the struggle between physical comfort and spiritual wisdom. The tension between light and dark. It is the overriding presence of my imposter that is burying Abba’s Beloved. Yet, its as if I am sitting here comfortably in my living room chair, engrossed in a movie playing on the television screen, while I’m also, somehow, simultaneously shoveling dirt on my own head. I am authentic in the sense that I know that I’m screwed up and that I deserve nothing of good consequence. By God’s unmerited favor alone will I be seen as humble, knowing my true self and living as a result of that knowledge. This entry was posted in God, life, religion and tagged authenticity, God, humility, life. Bookmark the permalink. I recall a specific moment one Sunday morning at church where I finally came to the point that I got tired of “straddling the fence” so to speak. I had grown to understand what God was asking of me, but was reluctant & fearful to completely turn my life over to Christ, which also meant putting away my own idols. Looking back, distractions and misplaced priorities were what kept me from reaching for the prize as well initially. Taking that first step to remove those distractions can be hard as we’re comfortable with a certain routine. Once you make up your mind to let loose of temporal interests, I think you’ll find the Holy Spirit guiding and helping you to establish a disciplined routine which becomes progressively easier and downright habitual.